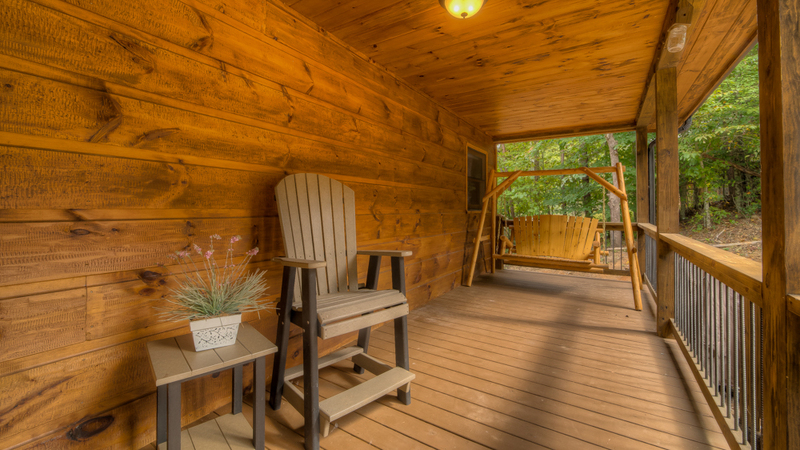 Perched on a hillside in the Mineral Bluffs community of Mountain High, the Blue Ridge cabin rental Mountain Laurel Hideaway is appropriately named: tall mountain laurel trees surround the property, hiding the cabin from view until you’re right in front of it. 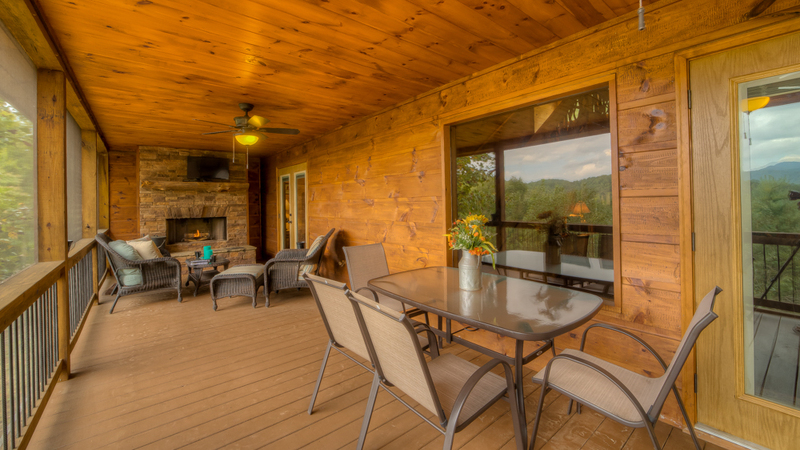 With its warm and inviting atmosphere and a spectacular view of the mountains from inside and out, this wooded oasis will enchant you from the moment you walk through the door. 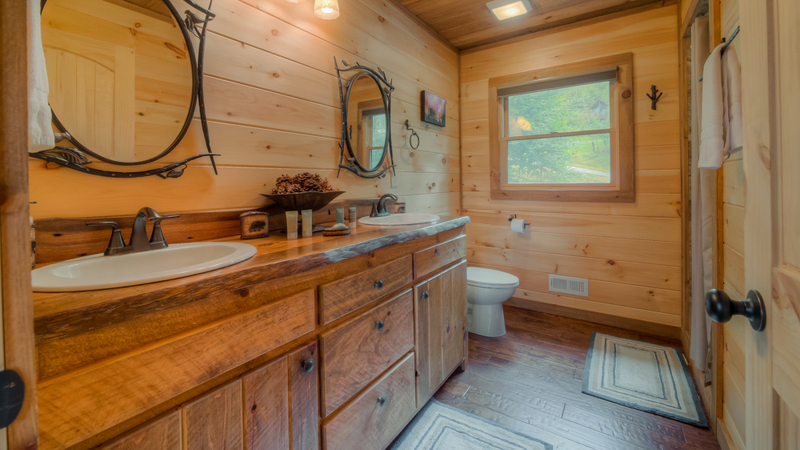 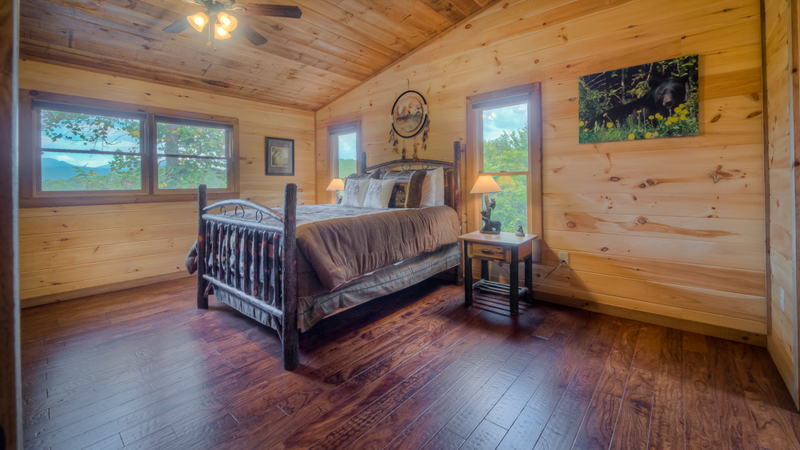 The cabin’s all-wood interior is tastefully decorated in a style that combines elegance and rusticity, with a wildlife-meets-Native American décor, the latter a nod to the owners’ ancestries in the Cherokee and Choctaw tribes. 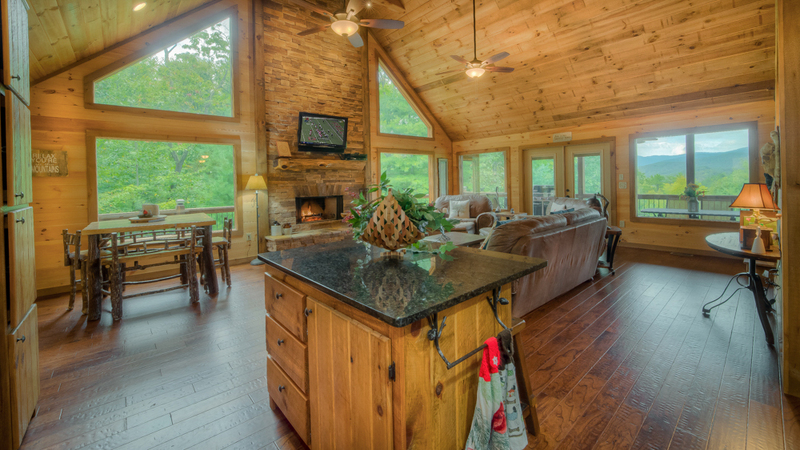 Huge windows in the main living area bring light and the beauty of nature inside, and ceiling fans provide cool breezes throughout the home. 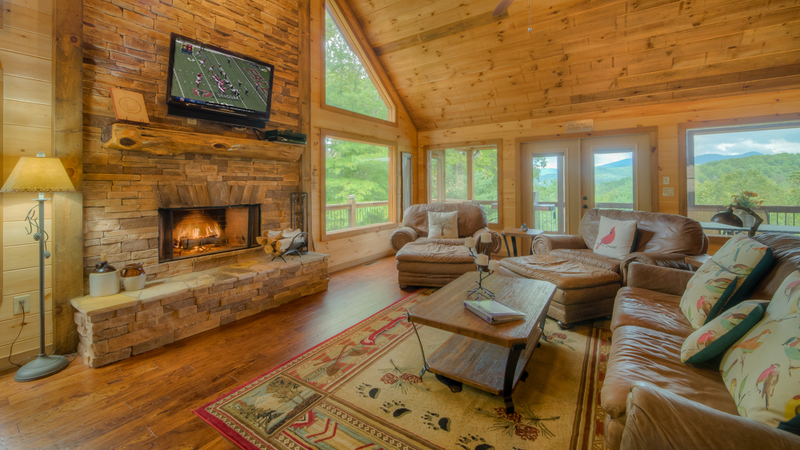 The open-plan great room, with its floor-to-ceiling stacked-stone fireplace, comfy leather couches, and 42” TV with DVD player, ROKU, and Dish Network, is the perfect gathering spot, and the adjacent kitchen is a cook’s dream. 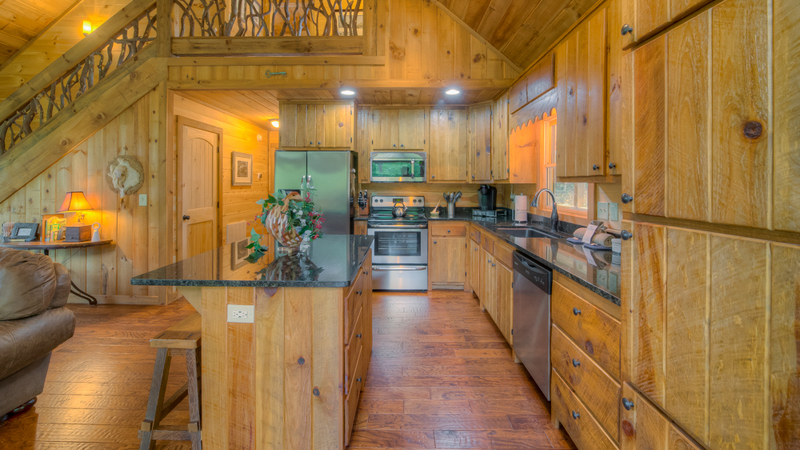 You’ll find granite countertops, stainless steel cookware, toaster oven, blender, waffle maker, Keurig and drip coffeemakers, and a kitchen island with a USB charging station. 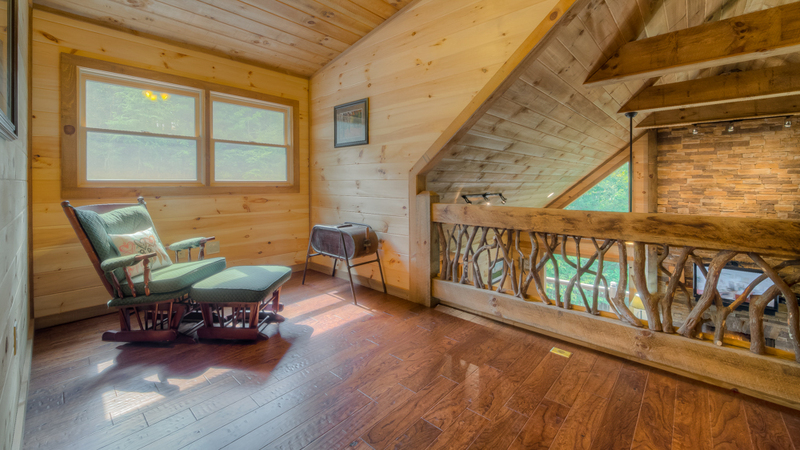 The dining table seats six, plus two at the island. 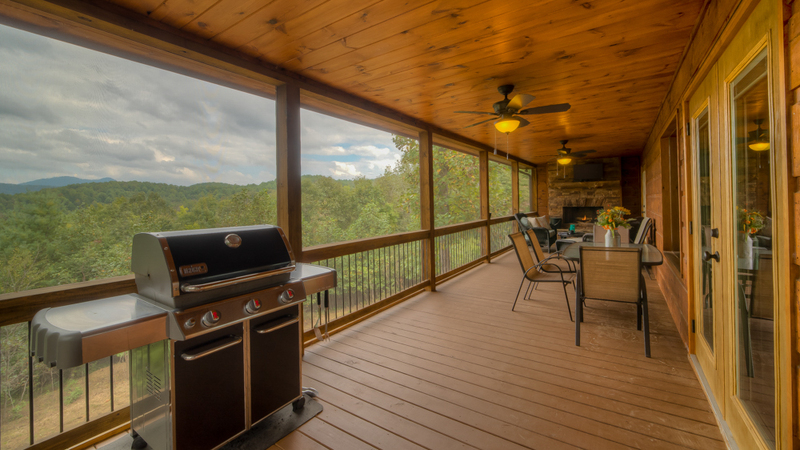 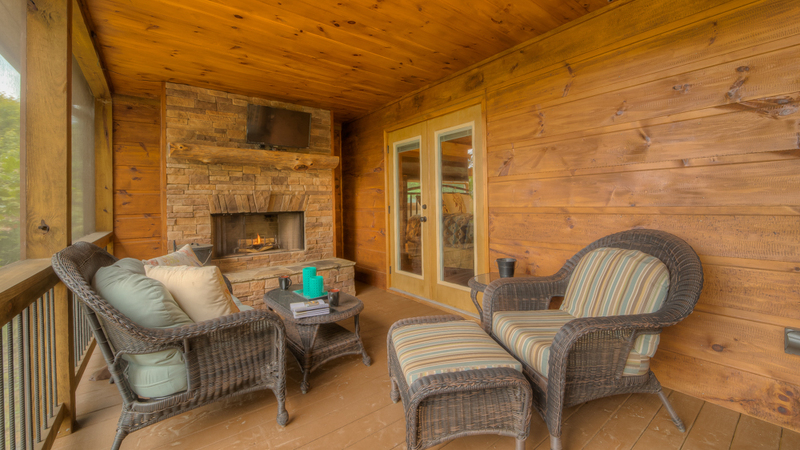 If you’re in the mood for a cookout, there’s a Weber gas grill on the screened-in porch, along with a six-seat dining table, stone wood-burning fireplace, a 32” TV, and a porch swing. 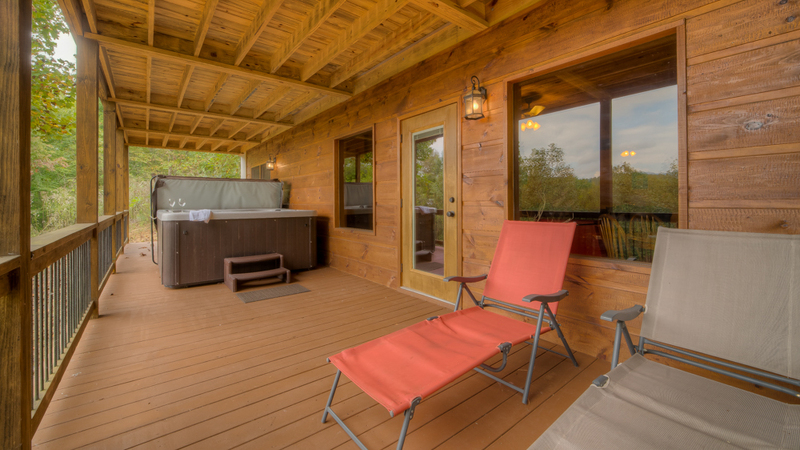 On the lower deck, there’s a hot tub with room for eight, so you can soak and relax while enjoying the magnificent view. 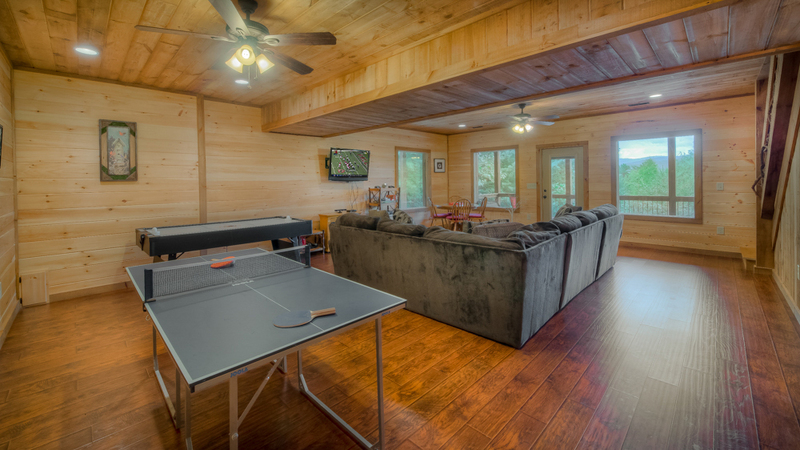 For indoor fun, you can head down to the game room to play air hockey, ping-pong, board and card games, or watch the Xbox-equipped 42” TV. 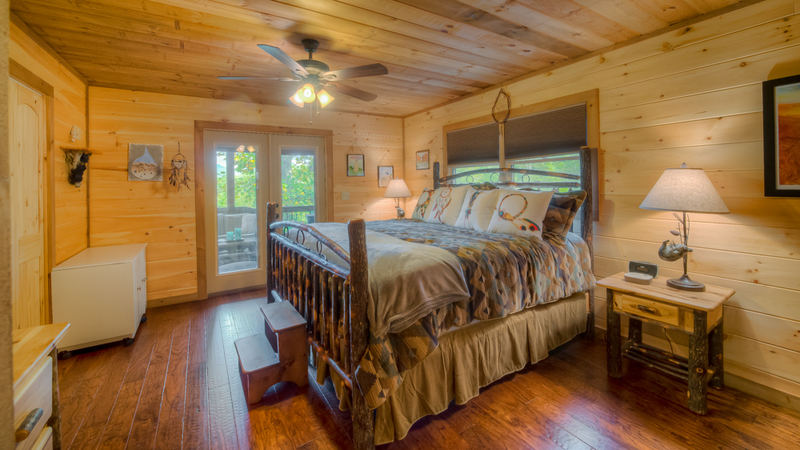 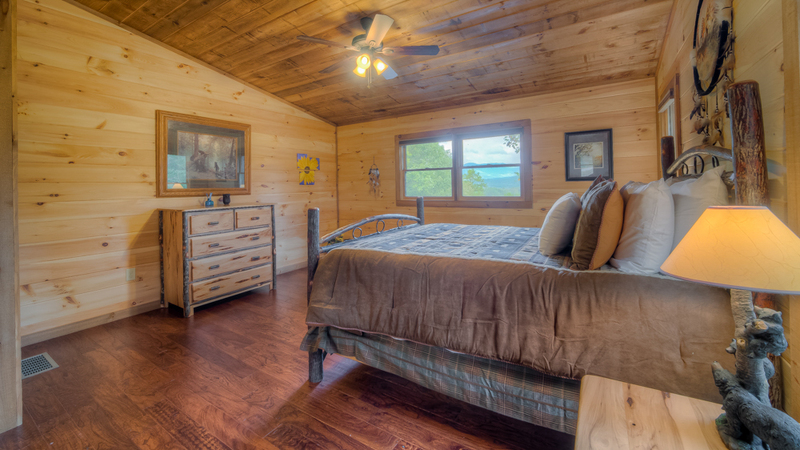 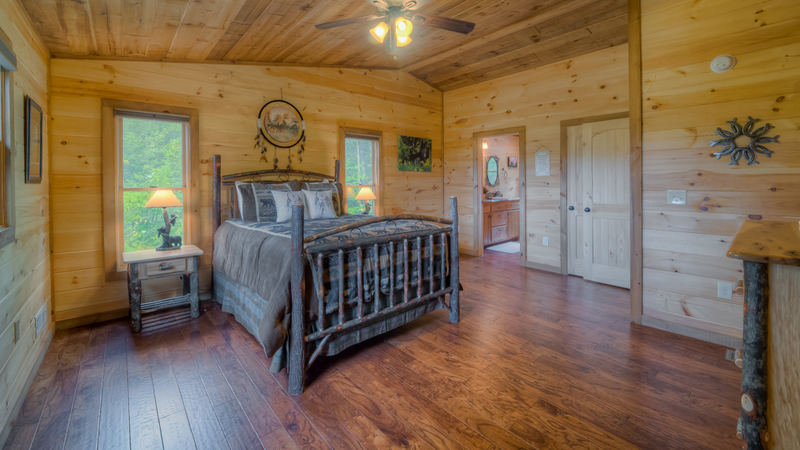 The cabin’s spacious bedrooms feature Amish-made natural matte finish log beds, luxurious bedding, and matching nightstands and chests of drawers. 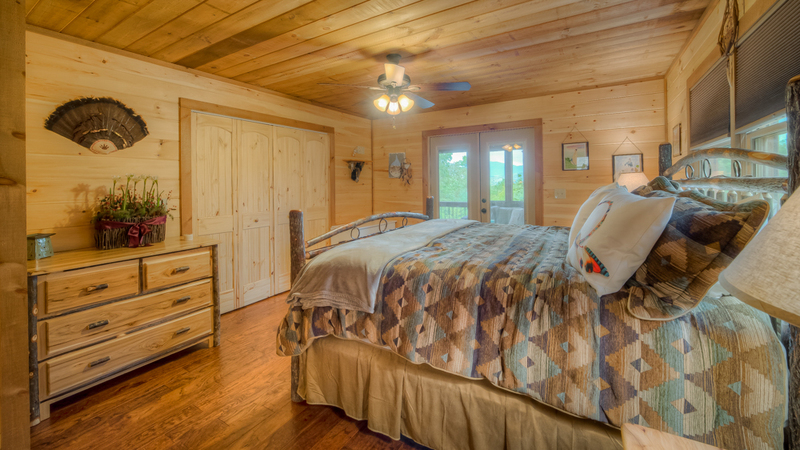 The main level master bedroom has a king bed and deck access, and the upstairs master has a queen bed and a walk-in closet. 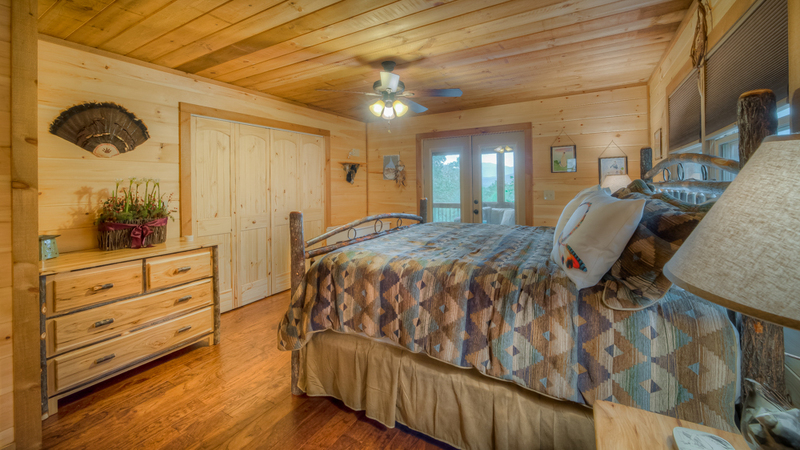 Both have pull-down blackout shades for those mornings when you want to sleep in, and private bathrooms with double vanities and large walk-in showers. 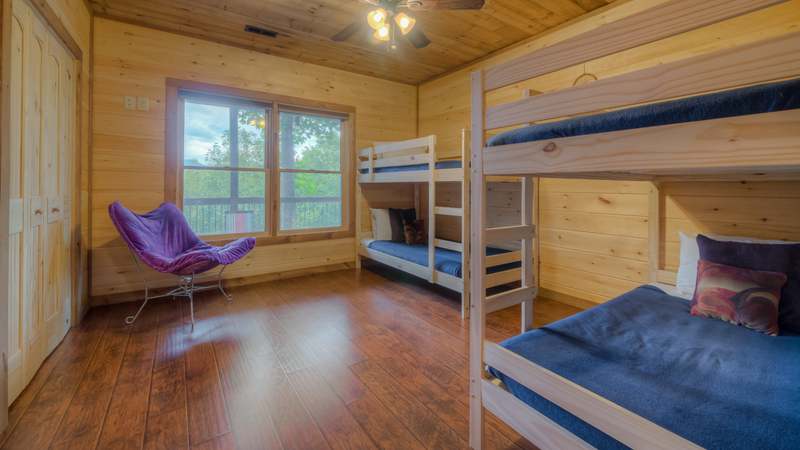 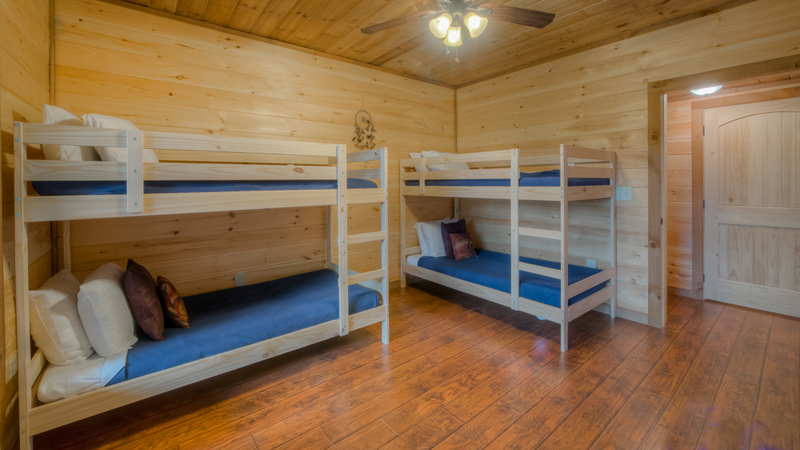 Downstairs, there are two sets of twin bunk beds in a bedroom perfect for kids, and an adjacent bath with tub and shower. 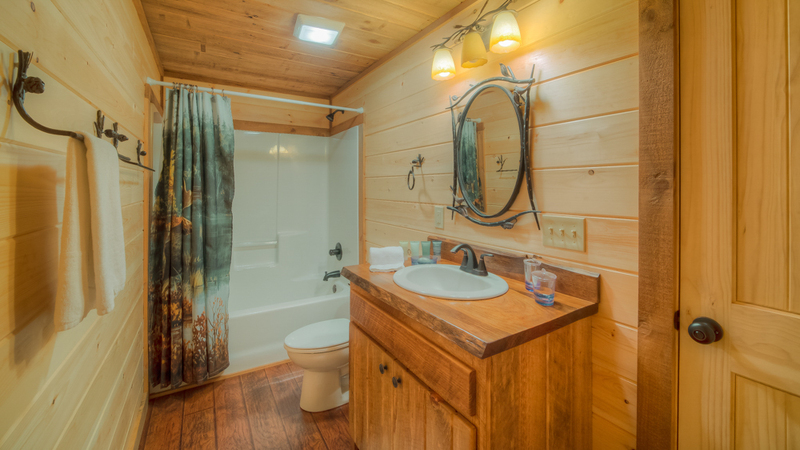 There’s also a half bath on the main level. 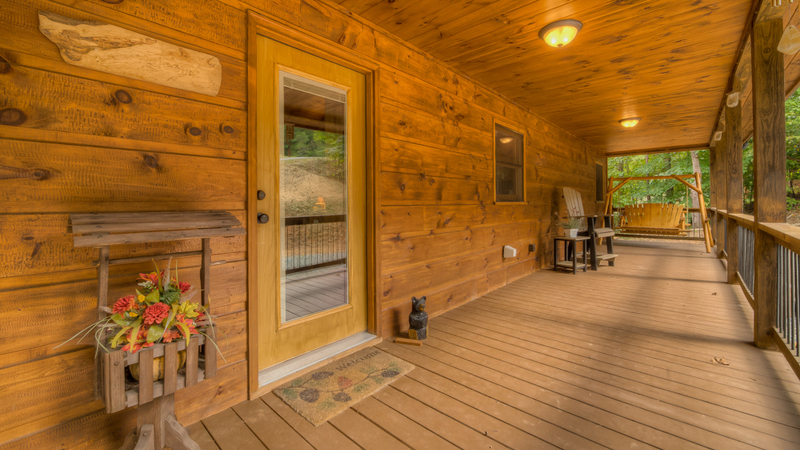 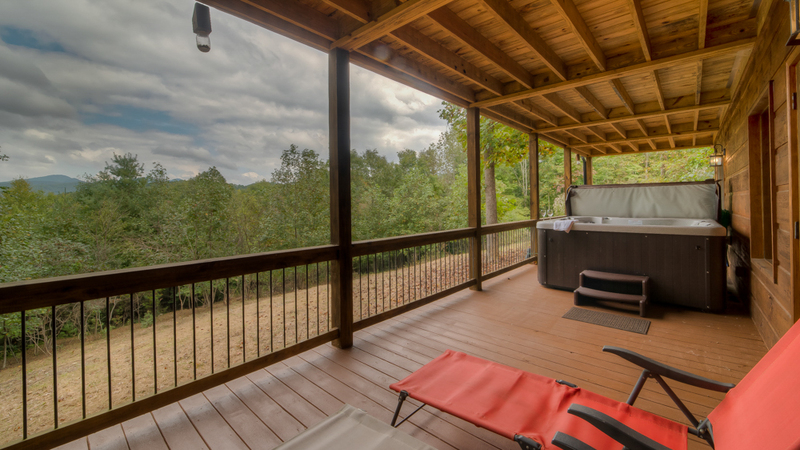 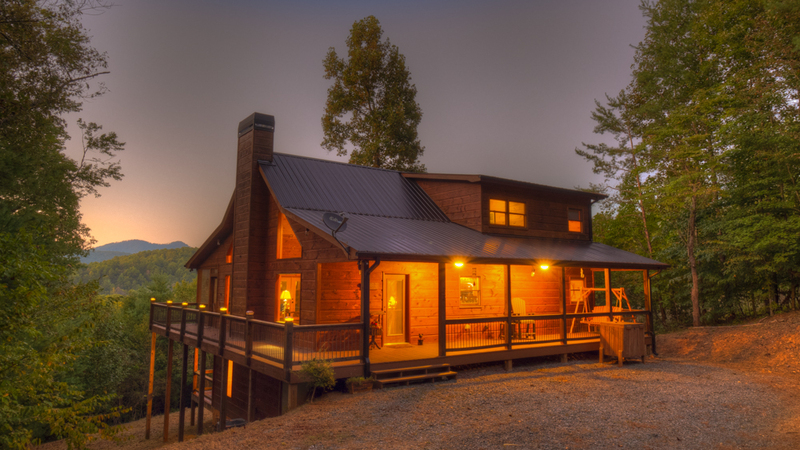 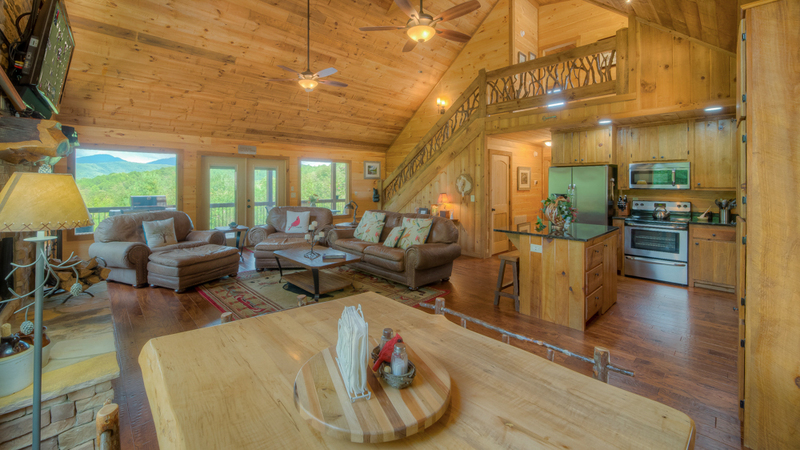 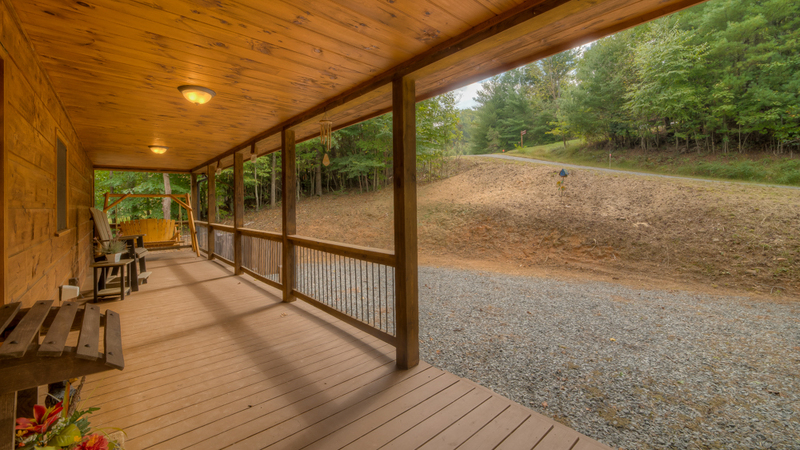 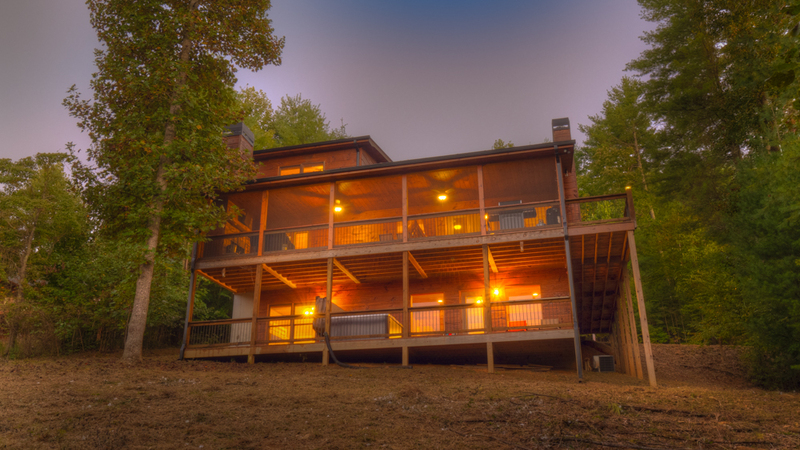 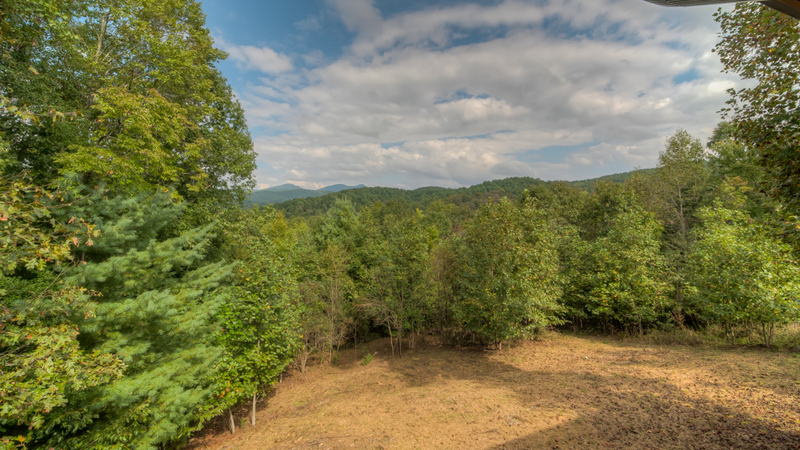 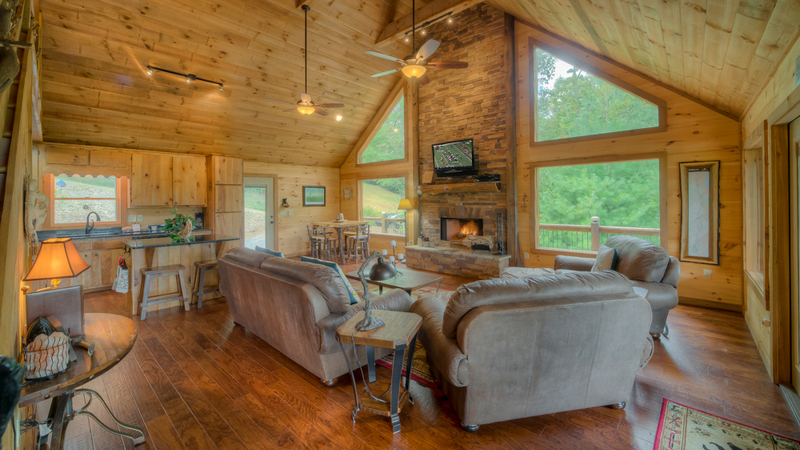 Mountain Laurel Hideaway is centrally located in an area optimized for fun and adventure, whether it’s rafting on the Ocoee or Nantahala Rivers, motorcycle riding the 11-mile ‘Tail of the Dragon’ part of US 129, or hiking the nearby trails. 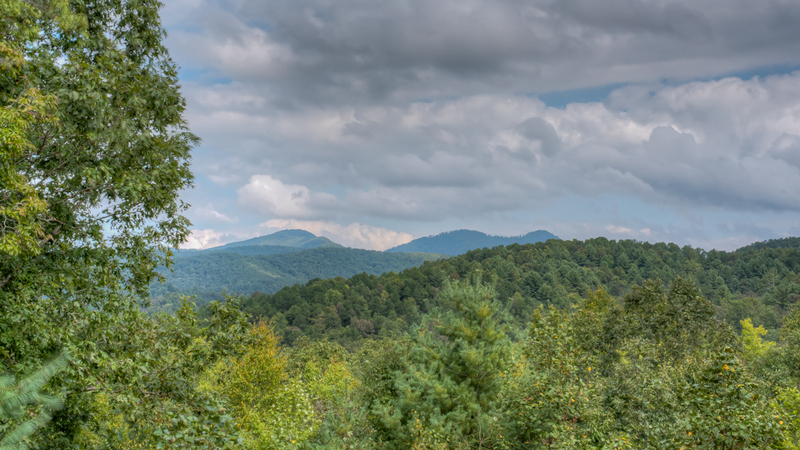 It’s less than a half hour drive to downtown Blue Ridge and about the same to Murphy, N.C., home of the Cherokee Casino. 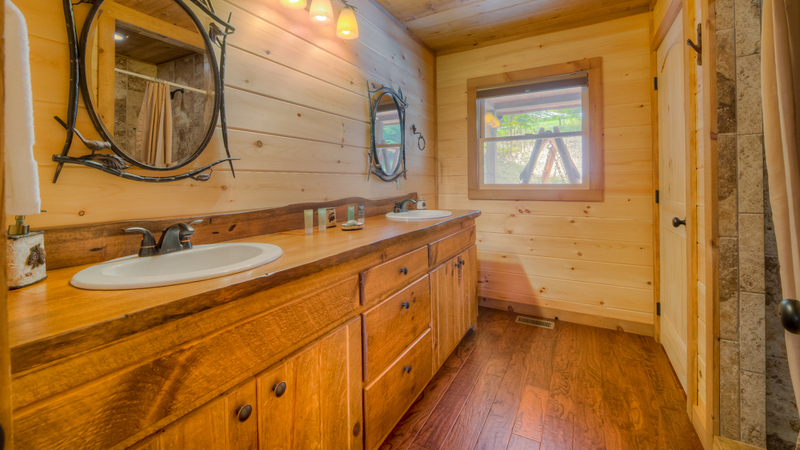 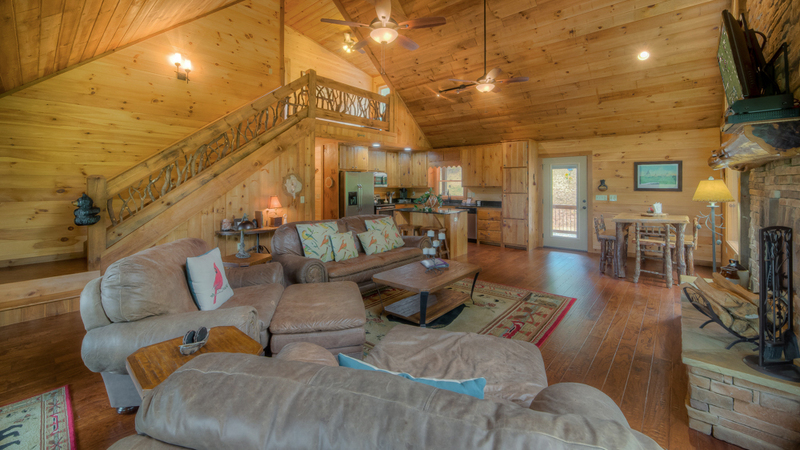 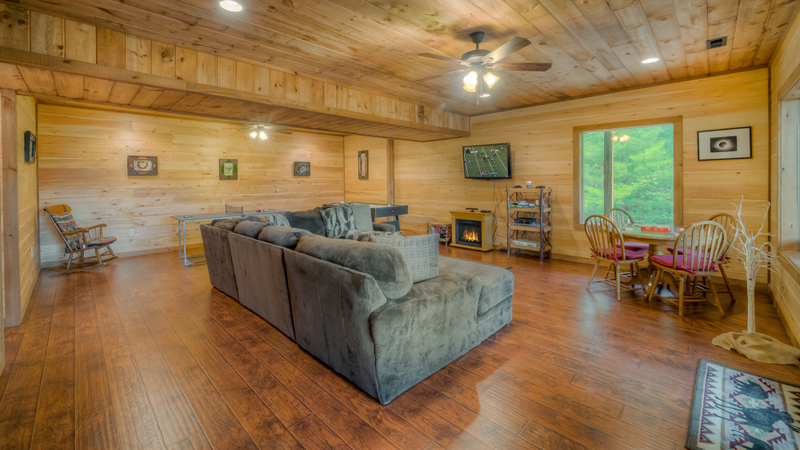 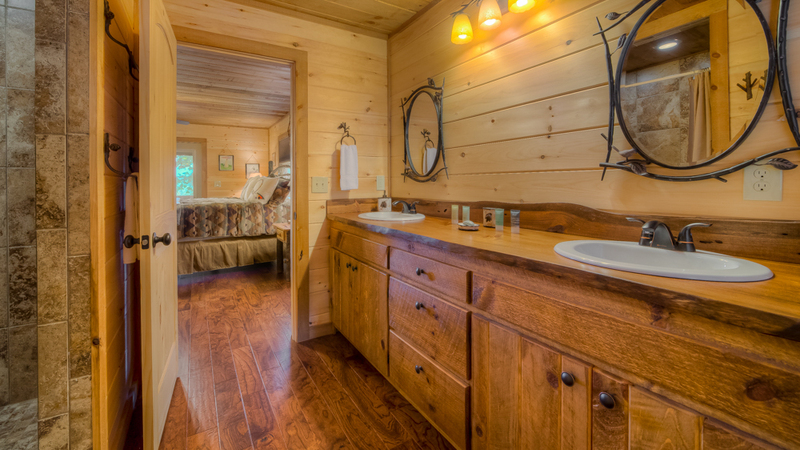 Other amenities at the pet-friendly cabin include wireless Internet and a washer/dryer, located on the lower level. 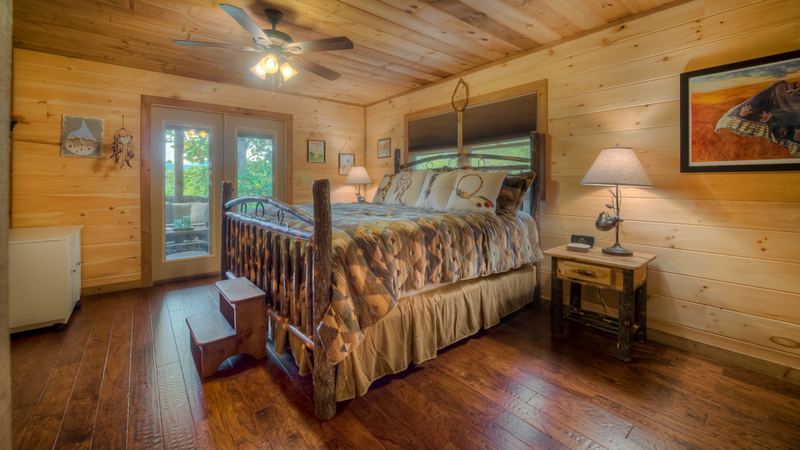 This special place offers the best of two worlds: it has all the comforts of a home away from home, and it promises you a vacation you won’t find anywhere else. 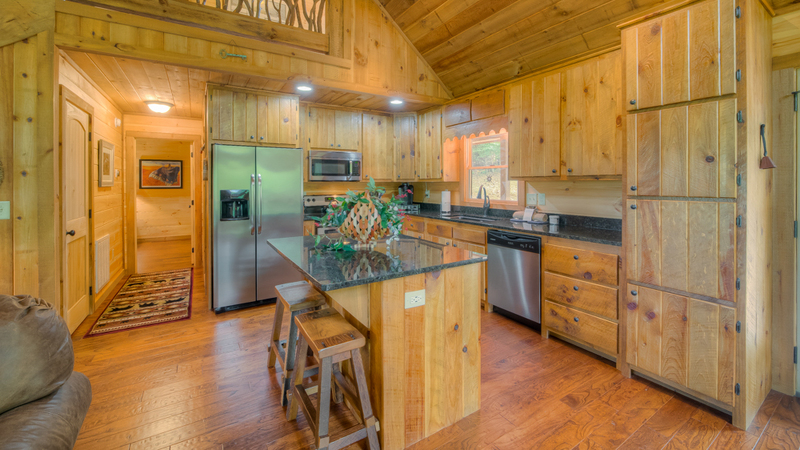 12/18 - The home was even more beautiful than displayed in the photos. 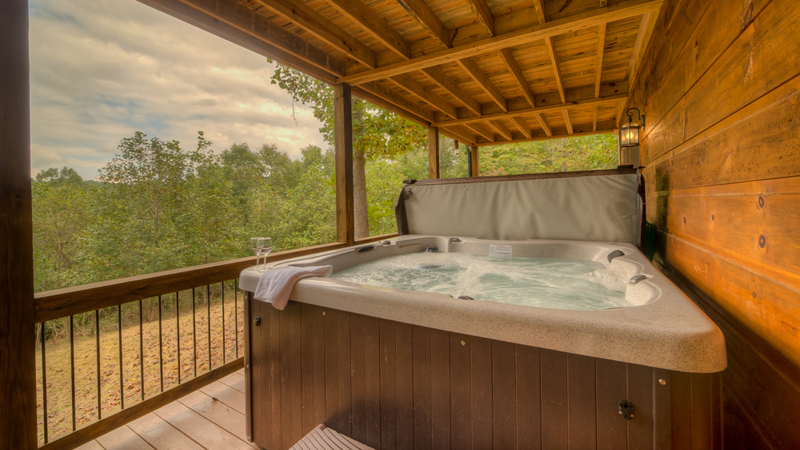 The customer service was great and accommodated my requests outside of business hours.